Everyone loves the feeling of smooth hydrated skin. Many spend a lot of money looking for a dry skin cream. Our skin is a complex living organ that is in constant exposure to the environment. Therefore, we have to make sure that it is nourished and protected from environmental impurities. At Clear Medical we want everybody to enjoy healthy radiant skin from within the skin to the bit we see and feel. Our bodies are approximately 65-70% water which ensures a healthy and radiant skin condition. Drinking more water replenishes what we already have and removes the by -products of activity within us. Many people suffer from dry skin at some point in their lives and drinking lots of water helps moisture into the skin. It also helps to maintain a healthy metabolism. Research shows that a deficiency of the protein ‘filaggrin’ (FLG) is the cause behind dry skin conditions. Release of individual filaggrin polypeptides occurs during the cell metabolism process. In the stratum corneum the FLG is broken down to generate amino acids that contribute to the moisturising factor within the skin and the formation of a healthy barrier. In addition, hormones and dietary habits also play a part in severe crusting or discoloration seen on the skin. Ethnicity and genetic susceptibilities may also affect the appearance of the skin; the severity may differ from one individual to the next. Crucially, the dry skin disease may become worse if care precautions aren’t taken, sooner rather than later. Not caring for your skin properly has a negative effect on the skin barrier. Genetics and internal biological mechanism also play a role in the condition of your skin; some people are more susceptible to dry skin as a result of their genetic makeup. 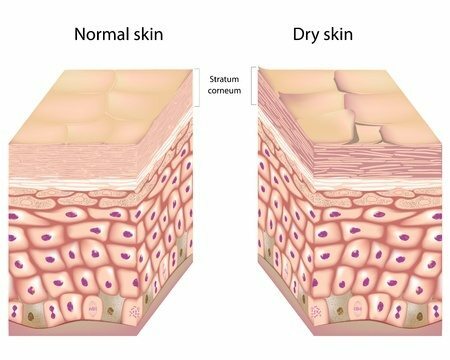 Usually, in the case of dry skin, the top layer of the skin (the stratum corneum) becomes crusted and gives a flaky appearance. The extent of this barrier imbalance varies and may result in rough and uneven skin. Moreover, the nerve fibre density within the skin increases in dry skin conditions which causes the itching sensation. Individuals who are suffering from a dry skin disease such as eczema, psoriasis, dermatitis will experience these symptoms. What dry skin cream should you use? There are many types of different dry skin cream and treatment techniques on the market these days but not all are beneficial for your skin. Creams and ointments prescribed by your doctor are not as effective as you would like them to be. They are prone to thinning the skin and causing addiction to them. This is because creams and lotions contain chemical toxins which penetrate into the skin and cause disease. For further information about this you may see the EWG’s Skin Database for advice on different levels of safety. However, at Clear Medical we only use and sell products that do not have any long term side effects because we utilise natural ingredients. We do this as we believe that natural is best! 1. Our Tone & Defence Formula 100% Natural Skin oil – available in clinic and from our online shop. It will nourish and enhance your skin barrier better than a dry skin cream. 2. Our Cellulose Fibre Scrub Mitt – available in clinic and from our online shop allows you to gently exfoliate and stimulate cell turnover to reveal a healthy balanced skin. 3. Skin Rejuvenation – can be carried out at mild levels, even on severely damaged skin surfaces to stimulate healing. Also, we advise that you supplement any skincare regime with a healthy balanced diet and regular exercise. If you opt for treatment, intervals can vary depending on various factors; including treatment area and health of the skin. The treatment number required can also vary depending on an individual’s ethnicity, immune system, stress levels, internal and external biological environments, and the time between each treatment. We will keep you fully informed throughout the treatment process and will discuss with you our expectations on how long the treatment may be necessary. We advise you to nourish, heal, and protect the skin barrier over time in a continuous manner. Treatments at Clear Medical are carried out with care, knowledge and experience and always with the client’s best interests in mind. Our clients are always pleased with the quality of the treatments they receive. It is very difficult – with the lack of regulation within this industry – to find specialists who genuinely care about the client as well as their business. Clear Medical Clinic is a clean, relaxing and welcoming environment, whilst providing you with the perfect setting for advice, care and treatment.